I hope you had a wonderful weekend! Cab and I got in late last night from a fun weekend in Bethany Beach, Delaware. My bestie Megan has a condo at the beach and I used to go with her and her family all of the time growing up! We decided to head to her condo for a mini vacation this weekend and some much needed relaxation! I came home with a sunburn and weighing an extra five pounds.. so I'd say our trip was a success! 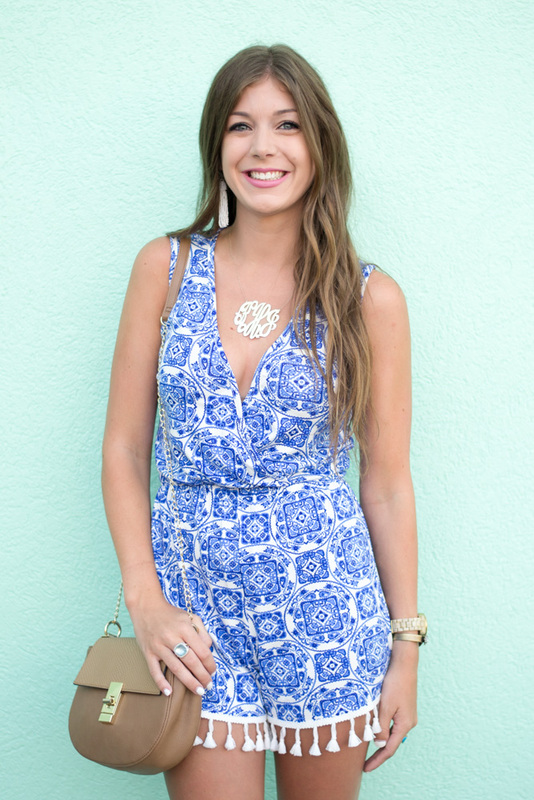 When I saw this romper, I knew it was love at first sight! First of all, the tassel hem... and it looked so comfortable online that I had to try it myself. And let me tell you, it didn't disappoint! I could wear it around all day and love every second of it! If you haven't noticed, these wedges are the only shoes I seem to be wearing lately, but can you blame me?! They are too cute and super comfortable.. hard to pass up!! Did y'all do anything fun this weekend? I'd love to hear! Love that romper, and love those shoes! I'd wear them all the time too If I owned them. I've been looking for a pair like that! Love that romper! Those tassels are so fun! Love this romper!!! The tassel hem completely makes it :-) Bethany is such a great place!! Our favorite is Rehoboth...we were there for a week in June. What a cute romper - I love the tassels at the bottom! Love this romper on you!! The tassels are darling and love the print! That romper is to die for!! LOVE. In love with those wedges! They've been on my wishlist for quite a while! You look fabulous!! That's the cutest romper! I love the tassels on the hem!! We're headed to the beach next weekend too so, I might have to take some of this style inspiration with me! Tassel hem!! To die! I can't wait to buy! You are seriously stunning!! I adore every picture and freakin' adore this romper!! It's perfect on you. love those shoes! I'd wear them all the time too If I owned them. I've been looking for a pair like that! Great post, thanks for sharing!